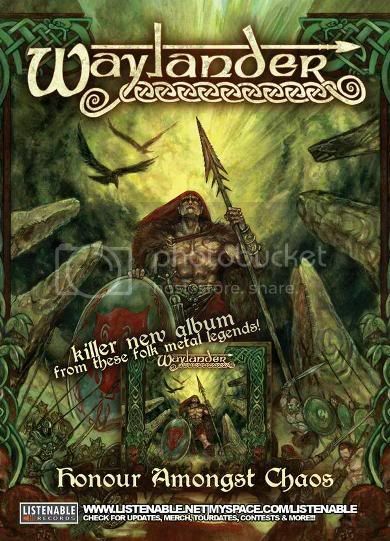 Long-running Irish folk metal act WAYLANDER has posted a lengthy update on the band's official MySpace blog. A couple of excerpts follow below. "The summer was quiet for us on the gig front, so we took the opportunity to begin the writing process for another album. We have a start made on three songs and intend getting stuck in properly fairly soon. Some tentative song titles at this early stage are 'Twin Fires Of Bealtaine', 'Kindred Spirits' and 'Sacred Centre'. "We have a few more concerts confirmed for the rest of the year. On October 16, we will be back in Germany to play at Fimbul Festival in Fürth and the next day we will appear at the Gathering of the Clans festival in Coalville, Leicestershire in England. We will also be appearing at Hard Rock Hell in Prestatyn, Wales on the first weekend of December as well as Winterfest in Cork, Ireland on December 19." WAYLANDER's latest album, "Honour Amongst Chaos", was released last year via Listenable Records. According to a press release, the CD is "more powerful and beautiful than ever, using a vast array of Irish folk instruments and armed with their passion for metal in its truest form," according to a press release. "Blending epic atmospheres and relentless brutality, 'Honour Amongst Chaos' reflects the heart and soul of pagan warriors worldwide."